I received my July Birchbox today. This month Birchbox "teamed up with Glamour [magazine], whose summer issue celebrates the five senses of summer, to bring you a Birchbox that guarantees a multi-sensory experience." I'm happy to say I think they did a fairly decent job of providing a "multi-sensory experience." Use this green-turquoise polish on fingers and toes all summer long. Direct from London, these punchy color liners feature a pen-style applicator that's truly goof-proof. The fragrance equivalent to a wink, this fanciful scent layers fresh citrus and jasmine notes over a base of lavender and pumpkin. Wear this award-winning brand's silky SPF 30 serum under your makeup for a weightless UV shield. Keep these refreshing, tea-infused mints on hand for quick pick-me-ups. We designed these neon headphones just for you. Pair them with your best playlist. I love my box this month! I'll use each and every sample I received and am happy to have them. Good job, Birchbox! 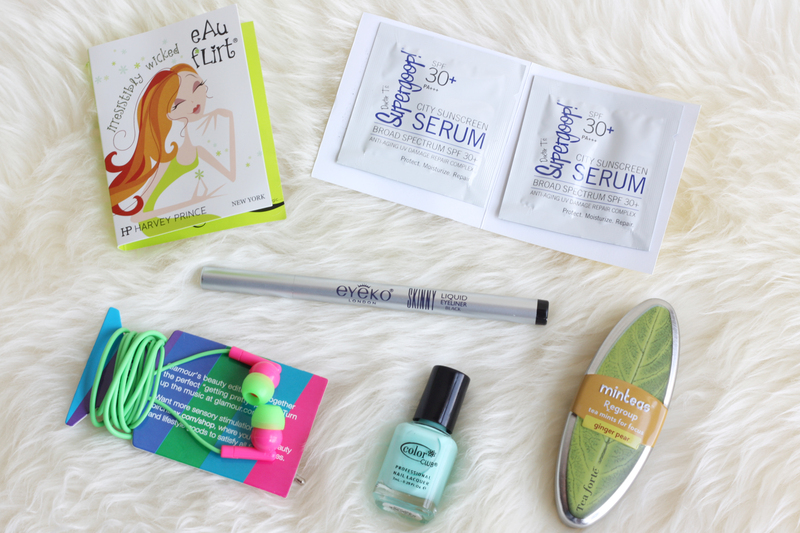 Now for some brief thoughts on the samples from my June Birchbox. Honestly, the self-tanning towelettes and men's cologne sample have gone untouched. 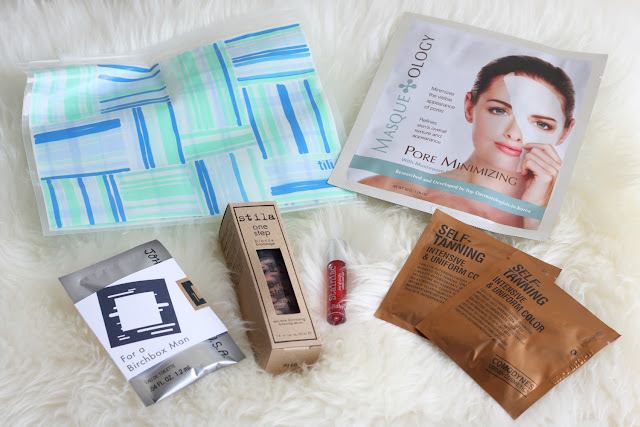 I have also yet to try the mask, but that is because I'm so excited to use it that I've been holding off for a special occasion when I want my skin to look especially nice. Hubby and I are attending a wedding this weekend, so I'm planning on putting this to use before that. The Stila One Step Bronze was just an awful mess of a product. 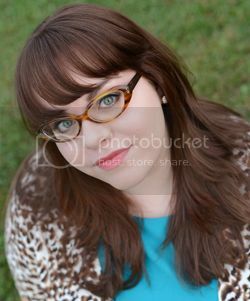 It made my pale skin look muddy and entirely too glittery. I'm still on the fence about the stain: I find it doesn't show up very well on my lips at all unless I apply quiet a few layers of the gel, but then it tends to look blotchy and weird. I still have hopes that the mask will be good, but otherwise, last month's box was a big miss for me. I'm glad I love my July box! 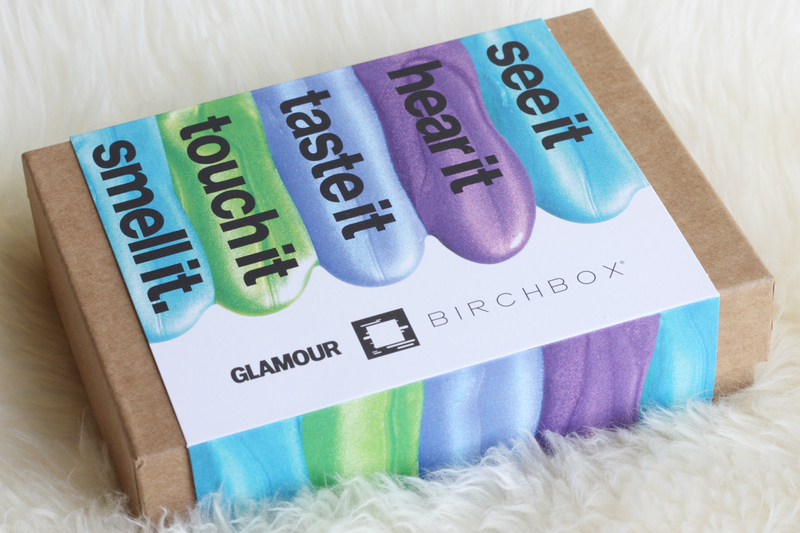 Would it be possible to know the weight for your July birchbox?